The idea of creating a specialised agency to manage the road sector has started paying off. The Uganda National Roads Authority will this financial year construct 344 kms of new roads and carry out rehabilitation works on over 1,000 kms of paved roads. According Dan Alinange, the spokesman for the Uganda National Roads Authority (UNRA), Uganda has a road network of 10,820kms designated as national roads, 23,000 kms designated district roads; 2,800 kms designated as urban roads and 30,000 kms of community roads. This makes 39,420 km of all classified roads in the country. However, it is envisaged that about 8,000 km will be adopted as national roads this financial year thereby making 20,000 kms designated as national roads. The government this financial year remarkably increased the budget allocation for the road sector prompting Eng. John Nasasira, the Minister for Works and Transport, to make what was interpreted as a political remark to wit: "there will be no more pot holes by 2011". Uganda will hold Presidential and Parliamentary Elections in 2011. "Mr. Speaker Sir, I have made a total allocation of Shs 1.1 trillion in Financial Year 2008/09 to the road sector for road development and maintenance. Including development partners project assistance equivalent to Shs 347 billion, this now makes this sector the largest single allocation in the whole budget overtaking the education sector for the first time in many years," said Dr. Ezra Suruma, Minister for Finance, Planning and Economic Development reading the 2008/9 budget in Parliament. With the security and confidence that comes with resources, UNRA has embarked on feasibility studies to design a total of over 1,200 kms of new road-upgrading projects in various parts of the country. Engineer Peter Ssebanakitta, UNRA's Executive Director says the strategic long term planning is necessitated by the long project cycles covering feasibility studies, design, procurement and construction. And Ssebanakitta may have 'deliberately forgotten' to add that the availability of funds now affords UNRA the confidence to make long term plans. 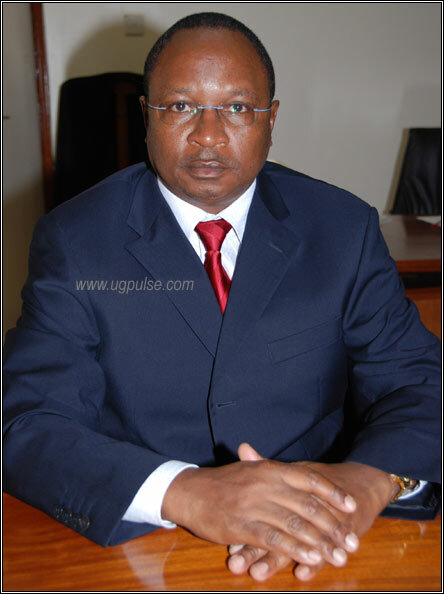 UNRA Executive Director Engineer Peter Ssebanakitta. At a press briefing held at UNRA offices on October 1st 2008, Eng. Ssebanakitta revealed that his organisation was carrying out a programme dabbed 'Operation No Pot Holes'. "UNRA is currently on a countrywide programme to seal all potholes and edge failures on all national bitumen (tarmac) roads," he said. 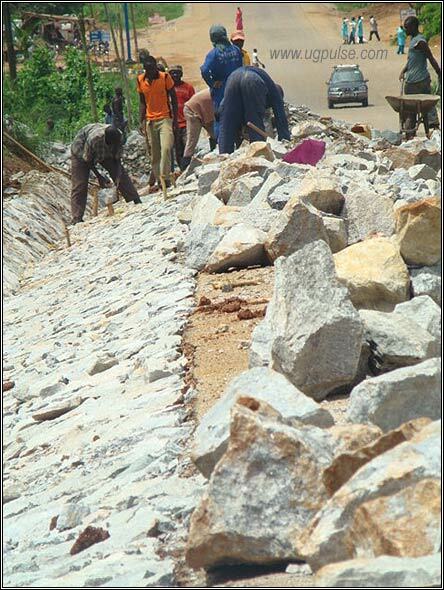 In addition to the repair of existing roads, UNRA is also undertaking a comprehensive road upgrading programme. This entails upgrading of roads from murram to tarmac, reducing corners and slopes, increasing width and redesigning of humps. Eng. Peter Ssebanakitta brings to UNRA a wealth of experience and knowledge of the road sector. He holds a Bachelor of Science Degree in Engineering from Makerere University and a Masters of Science in Highway Engineering from the University of Birmingham in UK. Joining the Ministry of Works and Transport in 1981 as a pupil engineer, Ssebanakitta worked in various positions rising to the rank of Commissioner for Roads before joining the Road Agency Formation Unit as the Maintenance Division Manager. He later became RAFU's Engineering Division Manager before he was appointed as the Executive Director of UNRA in July 2008. His 27 years of experience span across road maintenance management, road development projects management and planning in Uganda's road sector. During his five year tenure as Commissioner for Roads in the Ministry for Works and Transport, Eng. Ssebanakitta was responsible for the management of development and road maintenance activities on the national roads as well as developing and coordinating policy for the district, urban and community access road network countrywide. And as RAFU's Engineering Division Manager, he was responsible for the management of all upgrading and rehabilitation projects on the national roads network. In an earlier interview, he claimed to 'have intimate knowledge of both the national roads network and the road industry in the country'. But UNRA faces the challenge of being dismissed as a mere change of name for Road Agency Formation Unit (RAFU), the Ministry of Works implementation unit antecedent to UNRA. Otherwise UNRA inherited RAFU's office premises, staff and responsibilities; more like calling a rose by another name. Yet there are critical dissimilarities between the two bodies. UNRA is a body corporate established by an Act of Parliament (The Uganda National Roads Authority Act 2006). UNRA's Executive Director is the Accounting Officer supervised by a board of directors appointed by the minister responsible for roads. RAFU was merely a unit in the ministry. There is also the challenge of the lack of meaningful participation of local contractors in the road sector. The local road construction industry is still underdeveloped. Most goods and services in the road construction industry are imported at high prices due to high transport costs and lack of research to 'add value' to local products. Construction machinery is not readily available. Eng. Ssebanakitta says UNRA appreciates the fact that local firms have limitations that curtail them from fully participating in road construction. He however says UNRA would support local firms by ensuring regularity and certainty of work opportunities for local companies; and the improvement of technical and business skills of private firms. Ssebaanakitta says that the major challenges that affect the local road construction industry in Uganda are: emphasis on the business aspect of firms with little or no reflection on technical competence; lack of a critical mass of local professional managers and specialists with sufficient experience and knowledge in the management and operation of large construction projects; the weak management capacity of local firms both at company level and project implementation level and high number of contractors for the available workload. Engineer Ben Ssebuga, the Director of Operations at UNRA, says all is not lost for the local contractors. "We support affirmative action for local contractors in a more institutional way. We are asking the local contractors to merge or to partner with international contractors. In fact foreign contractors who are in partnership with local contractors now stand a better chance to win contracts," said Eng. Ssebuga at a recent press conference. In the same vein of support for local contractors, UNRA plans to encourage the use of local materials, including the incorporation of 'marginal' materials in road structures for low-volume roads. They also intend to experiment with the use of mechanical stabilisation as a possible replacement for chemical (lime or cement) stabilisation, and the use of recycling to reduce construction costs. Indeed without affirmative action, local firms would not be able to win tenders for major road construction projects. Currently, there is no local construction company involved in major road construction projects. All the locals do is to fill pot holes. Almost all the major contracts are being done by SBI International (Israel) and RCC (Nigeria). This seeming duopoly carries with it the ominous fear that the projects would stall if their parent companies abroad had financial problems. Yet Uganda is not without such a precedence of project stalling over financial problems. In 1990s, Stirling Astalidi of Italy, hitherto the main contractors in Uganda, collapsed leaving many contracts under their Ugandan branches unfinished. The Jinja-Bugiri road (perhaps the most important road in Uganda because of its status as the only gateway to the sea) stalled for more than two years because the company contracted to work on it had financial problems. There was also the case of Energo Projekt during the disintegration Yugoslavia. Entebbe earned its name from the Lugandan word 'ntebe' (chair). In pre-colonial times, the town hosted the office (seat) of the chief in Buganda who adjudicated in legal matters of the inhabitants.